The awards keep coming for the Sprint Magic Box as this week the Small Cells Forum Award and Compass Intelligent Award were added to the GLOMO award won in February. Sprint Magic Box, manufactured by Airspan Networks, provides indoor coverage of up to 30,000 square feet and also extends data coverage outside. Sprint Magic Box increases download and upload speeds on average by 200 percent, giving customers a better data experience while streaming videos, sharing large files, and using their favorite online apps and services on most Sprint devices. 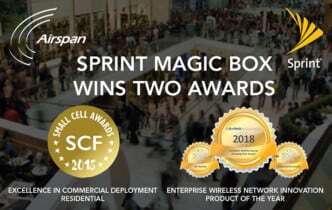 The company recently reached the milestone of more than 200,000 Sprint Magic Boxes distributed to businesses and consumers in more than 200 cities. The Small Cell Awards Excellence in Commercial Deployment (residential) in conjunction with AirSpan. The award was given on behalf of the Small Cell Forum whose mission is to drive the wide-scale adoption of small cells. The award recognized Sprint for demonstrating that it developed and deployed a capability to customers which provides demonstrable cost savings, ease of use, and quality of service improvements. The 2018 Enterprise Wireless Network Innovation Product of the Year from Compass Intelligence. The global consulting and market analytics company recognizes products and companies that have made outstanding contributions in innovation, technology advancement, and have contributed a positive impact to the overall technology industry. The 2018 GLOMO Award from GSMA.The judges said – “With this solution, the partnership has successfully addressed the small cell deployment issues around speed, ease and cost”The Magic Box by Sprint and Airspan Networks is the world’s first all-wireless small cell. Magic Box requires no implementation, labor, or rental costs that are a hurdle for many traditional small cell deployments. The unit is simply placed near a window and plugged into a power outlet. Within minutes hard-to-reach indoor coverage holes are eliminated, and customer’s download and upload data speeds improve on average by more than 200 percent. The Magic Box simplifies network densification by using LTE UE Relay for wireless backhaul, and by connecting to macro sites at the cell edge it decongests overall network traffic.